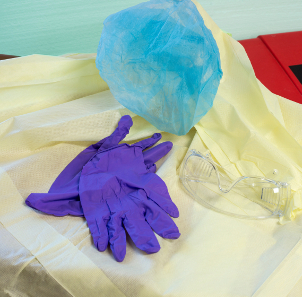 Preventing and controlling infections is a primary concern for health care workers. Learning about infection control and common sense work habits is important to meet the goal of controlling infections. This session is designed as an entry-level course for paraprofessionals learning about infection control. Common infectious diseases and protective practices associated with the diseases are discussed. This is a self-paced course with optional knowledge checks to after each lesson. These non-graded quizzes allow you to check your understanding of the material before proceeding to the next section. After you have completed the module content you will be required to take the final exam. You must score 70% or higher on the final exam to pass the course and obtain a certificate of completion. State the importance of infection control measures. Describe the links in the chain of infection. Explain the purpose of the Employee Right To Know Law. Describe the importance of hand hygiene in the prevention of infection. State the various components of Standard Precautions. List three common infectious diseases. Outline steps to take control of the spread of infection in the home. This course is designed to meet the continuing education requirements of healthcare paraprofessionals, such as home health aide, nurse aide and personal care attendant. Kimberly Aronhalt received her Bachelors of Science Degree in Nursing from the University of Evansville, Evansville, Indiana and her Master of Arts degree in Nursing Leadership from Ausburg College, Minneapolis, MN. She has over 35 years’ experience healthcare including home care for maternal-child, adult and hospice populations, Assistant Professor of Nursing at Mayo Clinic College of Medicine and Adjunct Nursing Faculty for several community colleges in Minnesota. Over the last 9 years, Kimberly has developed her expertise in infection prevention and control as an Infection Preventionist and Supervisor in Occupational and Employee Health at Mayo Clinic as well as an Infection Control Specialist for a large senior living community including independent living, assisted living, skilled nursing and memory care. During that time she has co-authored numerous articles related to infection control and reduction.